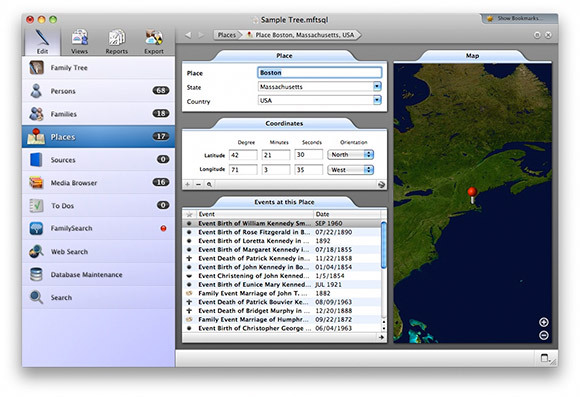 MacFamilyTree 6 was discontinued and replaced by MacFamilyTree 7. MacFamilyTree 6.3.9 can still be downloaded as of February 2015, through Synium Software’s support page. FamilySearch integration no longer works within MacFamilyTree 6 – see this Synium Software page for details. * Price (Upgrade): Discount for version 2.x, 3.x, 4.x, 5.x users, see Synium Software. iPad / iPhone / iPod Touch Support? * A previous version, MobileFamilyTree was cheaper, and only supported MacFamilyTree. The new version, MobileFamilyTree Pro fully (and easily) supports MacFamilyTree, but it also functions as a standalone mobile genealogy application. Mac OS X 10.7 Lion Support: As of August 15, 2011, Version 6.1.3, it now supports the fullscreen mode of Mac OS X 10.7 Lion. Easily enter and then visualize your family history. Be it creating reports, diagrams or browsing your data in the innovative 3D view called Virtual Tree – MacFamilyTree offers a solution for every task. Get an overview of where you hail from and maybe enthuse your relatives about exploring your family’s past at your upcoming family reunion. Collect data and enter it in MacFamilyTree on your Mac or MobileFamilyTree on your iPhone, iPod touch or iPad. Genealogy work has never been more convenient and rewarding. 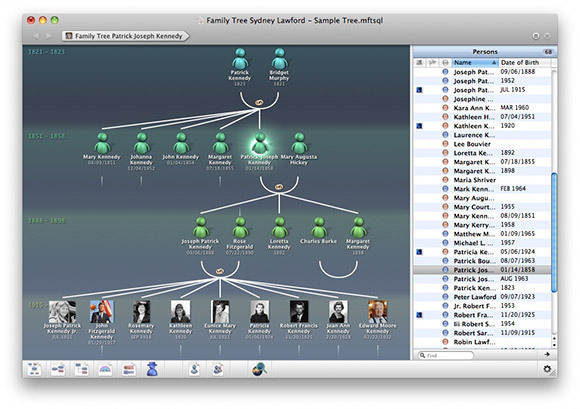 MacFamilyTree’s intuitive user interface makes the otherwise time-consuming work of entering all information about family members comfortable and purposeful. Whenever you encounter new information, adding it to your data is a breeze. * Integrates with Apple’s MobileMe service. 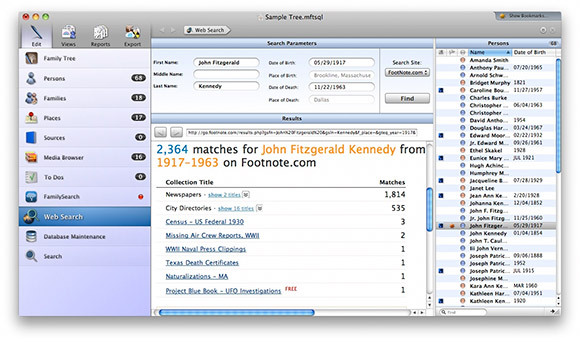 * Free use of www.MacFamilyTree.com for publishing and sharing your family trees online, with security/privacy features if needed.